Clothing & Gear: I think I used the best clothing gear, from trail shoes to my headlamp lighting system. My “layering” of my upper garment was perfect with a sleeveless Uniqlo shirt inside my Red PAU short-sleeved shirt with my Patagonia “Houdini” Windbreaker Light Jacket. I feel warm with my MIUT Buff/neck Gaiters; Compressport Headband and Salomon Running Cap. I had Giro Cycling Gloves with my LEKI Carbon Trekking Poles. 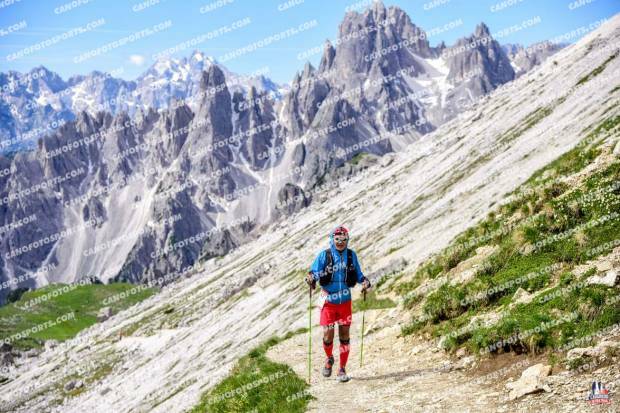 My Salomon Speedcross 4 was perfect for the trail in Lavaredo which I used for two months in my training leading to the event. I was using a Salomon EXO Twinskin Short (Red) which was light, comfortable, and provided me with warm feeling during the night run. Salomon 5L Sense Ultra Hydration Vest & Pulse Belt: My Salomon Vest carried all the Mandatory Gear and Nutrition Needs for the whole course/event as I opted not to have any Drop Bag at Km 66/Cimabanche Aid Station. 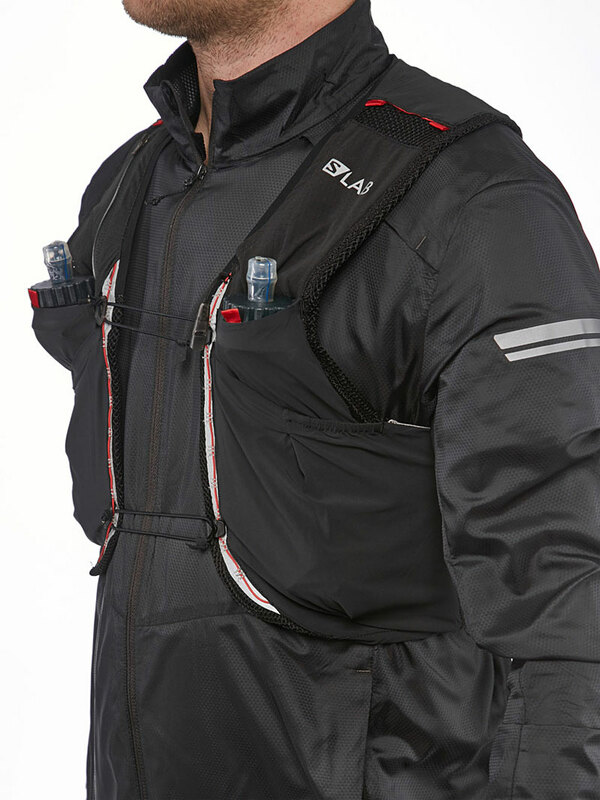 My Salomon Pulse Belt was perfect for my Trekking Poles; additional nutrition (Skyflakes) and Cellphone. Training: My “mountain and hill repeats” were very effective for the uphills and downhill runs for short duration/distance along the course. Nutrition & Hydration: I only have 5 pieces of Power Gels for emergency situation; 6 pieces of KIND Power Bar; 4 packs of SkyFlakes Crackers (Condensada); NUUN tablets: and two pieces of empty Ziplock. Pacing & Average Speed During The Race: I have a lot of lessons learned from my early DNF at MIUT in Madeira, Portugal. I needed to be very light during the race and trained for heavy loads (3 Liters of Water + Food) in my daily long runs in my Playground. I was satisfied with my average speed/pacing during my run at the TNF Lavaredo until I was slowed down with dizziness and pain on my knees. What Did I Do To Make It Right? My frustration in MIUT last April gave me a lot of lesson learned and I was able to adjust things during my training. My early arrival in Cortina gave me the time to adjust with the weather and the altitude. However, I should have visited Tri Cime and other higher elevations of the course by Bus but with my lack of knowledge of the area, I was limited in trying to find the first and last few kilometers of the course. 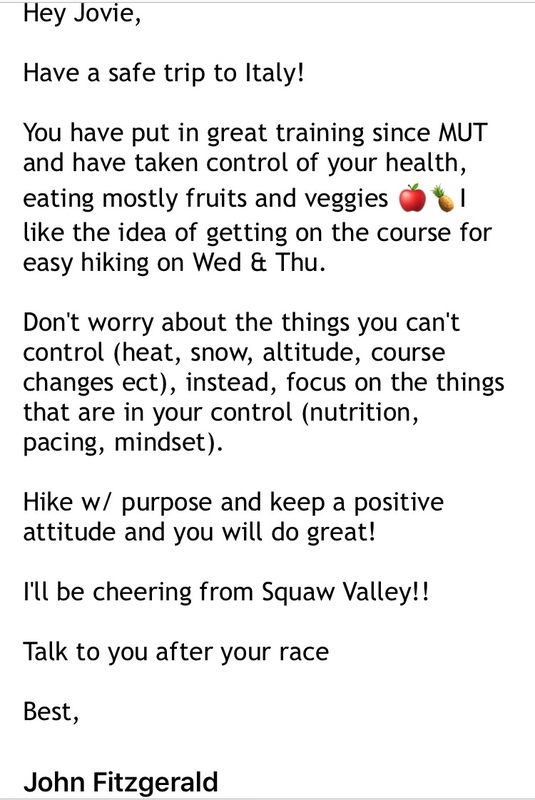 My CTS Coach John Fitzgerald sent me his last guidance with the gist/bottomline of focusing on the things that I could control during the race (nutrition, pacing, and mindset) with hiking with purpose and positive attitude. I learned a lot of variations on how to use the trekking poles during my training leading to this race. I really wanted to hike the uphills more efficiently with the trekking poles. I had more “push-ups” repetitions during my training days in order to make my shoulders stronger than what I had during MIUT. Bringing lesser gels, bars, drink mix, and lighter mandatory gear (Salomon Bonatti Waterproof Jacket & Pants and Columbia Long-Sleeved Shirt) made my weight lighter during the run. I also carried lesser volume of water from the start to lighten my load but also carried an extra collapsible Salomon Foldable Bottle just in case I needed more water during the hotter part of the day. After hiking the uphills, I would run at an easy pace on flatter and downhill portions of the course which gave me enough time to reach the First Cut-Off Time Checkpoint and put in more buffer time at the Check Point in Rifugio Di Auronzo. Bring at least two empty Ziplocks in your pocket (easily accessible) for obvious reason. What was NOT quite right during the race? I opted to run the downhills on the early part of the course without using my trekking poles, most specially, on the seemingly flatter sections but they are actually gradual descents. I was thinking that I would be faster in running the downhills by not using the trekking poles but I was wrong. If only I have used my trekking poles on all the descents, I could have saved my quads and my knees from having pain even if I was slower by a few minutes. My old knees and legs need some cushioning when running the descents to preserve them for the last half of the course which has more descents. I should have started to ingest my solid food on the start of the uphill climb from Lake Misurina to Rifugio Di Auronzo while on the move and not at the middle of the climb with a 3-5 minutes short stop and rest. I should have NOT stayed so long at the Aid Station in Rifugio Di Auronzo and spent a lot of time sitting and talking with the Indonesian guy. I should have limited my stay there by simply eating the soup pasta, drinking my Coca Cola, and refilling my bottles while I was standing. I could have shaved at least 10-12 minutes of my stay here. I really could not understand why I did not take the risk of taking some Aleve tablets to relieve the pain on my knees after the first switchback from Tri Cime/Peak of Lavaredo. I usually take these pain relievers on the middle of my race just to anticipate the pain on my knees which was very effective in solving the situation I am in in my past finishes. What is the best-case scenario? 1. With a buffer time of 40+ minutes from Rifugio Di Auronzo, I should have maintained it up to the next Cut-Off Time Checkpoint in Cimabanche and gambled any remaining buffer time in every Checkpoint up to the last Cut-Off Time Checkpoint before the Finish Line. 2. I could have used my trekking poles more on the downhill/descents to save my knees/legs and be able to hike relentlessly with purpose up to the Finish Line. The time that made me faster to run or hike on the flatter and downhill sections without the trekking poles was nothing if I could have saved my legs and knees and be able to pass the Cut-Off Time Checkpoints. 3. From the start, one bottle of water/electrolyte mix (500 ml) is enough up to Km 33 to make my load lighter from midnight up to early morning due to the colder air/weather. One bottle filled with liquid in one bottle and another 1/2 bottle of liquid, totaling to 750 ml is needed from Km 33 up to the Aid Station in Rifugio Di Auronzo (Km 50). Carrying just the right amount of water on my vest could significantly reduce the weight I was carrying. Which translates to lighter load to my knees and legs. What steps can you take to improve? 1. More strengthening exercises to my leg muscles. More push-ups and core exercises for my upper body. 3. More Mountain Downhill Repeats! Simply, the reverse of Hill/Mountain Repeats where one has to run or hike the downhill faster than going up to the mountain. This time, using my trekking poles! 4. Bring a lot of BUFF. One for the Ear Cover; one for the Mouth & Nose for the absorption of fluids due to “running nose”; and one for the neck. In addition, I can bring an extra BUFF to be looped on my wrist just in case I need a cloth to absorb some cold water from the streams to douse my head and neck during hotter part of the day. 5. If I have the time, I could have visited/recon by Bus or Car the highest peak or highest location along the course in order to acclimatize or take a brief hike. I applied for the lottery to join this year’s The North Face Lavaredo 120K Ultra Trail Race in Cortina D’ Ampezzo, Italy once the application for lottery was opened last October 2017. I was not hoping to be picked up in the lottery as I am always on bad luck with regards to Race Lotteries. Then I was surprised that I was included among the 1,500 runners who were picked up in the lottery. I just laughed it out when I knew the results as I wasn’t sure if I will continue or not because I was registered for the Madeira Island Ultra Trail (MIUT) Race in Portugal in the month of April 2018 due to some budgetary constraints. Moreso, when I was informed and requested by Ms Tess Leono to be her Chief, Support Crew for his participation in the 2018 Badwater 135-Mile Ultramarathon Race on last weekend of July 2018. It came as a double surprise to me that I will be going to the US after one month or less from my participation at the TNF Lavaredo in Italy on the last weekend of June. It was a hard decision for me to continue or not with my TNF Lavaredo and instead focus my financial resources for my trip to the US to be as the Lead Support Crew in her 2nd attendance/participation to the Badwater Ultramarathon. But there are things that are unexpected and things that I’ve forgotten where I could source such financial resources for my trips. I was just a matter of proper planning and programming or some resourcefulness that I was able to solve the problem. God has its mysterious ways when you believe in him through prayers and good positive deeds to other people in need! The registered with the amount of 120 Euros (almost P 7,500.00) for the 120K Trail Race through my postpaid Credit Card. Through “Trip Advisor” and booking.com, I was able to select my hotel accommodation and bus reservations. I was able to select the Dependance Hotel Cortina which was the cheapest during the time that I made my booking/hotel reservation. It was only a week before my departure for Italy that I made my reservations for my bus tickets from Venice to Cortina and back to venice for my flight back to Manila. Hey, it’s not easy to apply for a visa in any country for that matter if it requires that you have some source/s of income; some savings in the bank; some investments; and some real estate properties that you personally own. I think being old, retiree, and pensioner (and lots of visas outside the Southeast Asian Region) gave me more edge or advantage to have my visa approved in other continents like Europe, North & South Americas and Iceland! The application of visa for a visit in Italy is totally different than the other Schengen Nations as they have their own VIA (Visa Italy Application) and as compared from applying through VFS where most of the European countries contract the acceptance Visa Applications for their countries. Most of my Visa Applications through VFS were approved in 3 days (the fastest) and 5 days (the longest wait). My Visa Application for Italy was approved in 9 days without even informing me that my application and supporting papers were submitted already to the Italian Embassy in Manila. Plus the fact that the Parking Area at the VIA is very limited as compared to the building where the VFS is located. Be prepared to pay P100.00 for 3 hours at the VFS and P50.00 for 3 hours at the VIA. VIA and VFS offices are located at the Pasong Tamo Extension Street in Makati City. If you have the money to spare, one could get their Premium Service where a staff of the office would attend to you personally with coffee and snacks but be prepared to pay double for the visa application. For my Italy Visa Application Premium Service, I paid P6,000+ and I had to pick-up my visa at their office within a designated time of the day. It was already when I arrived from Madeira, Portugal that I finally decided to push through with my trip to Italy and that was before the end of April. 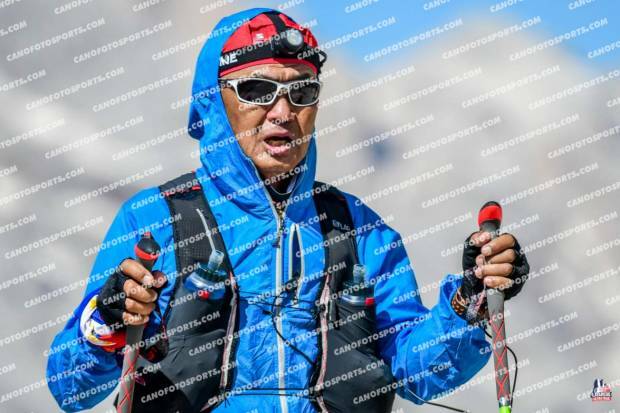 I asked Mon Beleno and Jerome Bautista about their flight arrangements and accommodation bookings to include on how to finally arrive at Cortina D’Ampezzo as they were the two Pinoy runners who participated and finished in last year’s edition. The hotel accommodation was very expensive in Cortina D’Ampezzo and I was surprised! 1,000 Euros for 6 days stay in Cortina is really very expensive! But I was able to book my hotel stay for 600+ Euros for 6 days which is about 5-minute walk to the City Center. 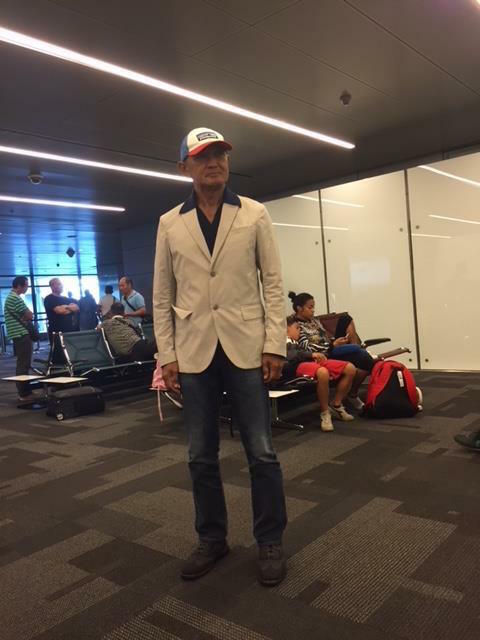 I was able to get a cheap Flight Ticket via Qatar Airways saving me at least $250 for the Round Trip Ticket with my Flight Departure at the Clark International Airport (on the early evening of Monday, June 18) and arrival at the Manila International Airport on the 29th of June. My flight was from Clark to Doha, Qater (for 9.5 hours) and then Doha, Qatar to Marco Polo International Airport in Venice, Italy (for 5.5 hours) but with a lay-over of about 7 hours in Hamad International Airport (from 12 Midnight to 7:00 AM the following day). My lay-over period served as my training for the sleepless nights for the race! As for the Bus Transport to Cortina D’Ampezzo which is 2-hour trip from the Marco Polo International Airport, costs from 12-18 Euros, depending on the Company name of the Bus. The selection of bus service transports are available at the website of the event. I took the FLIXBUS from Marco Polo International Airport to Cortina D’Ampezzo which I scheduled at least 3 hours after my scheduled arrival in Venice. 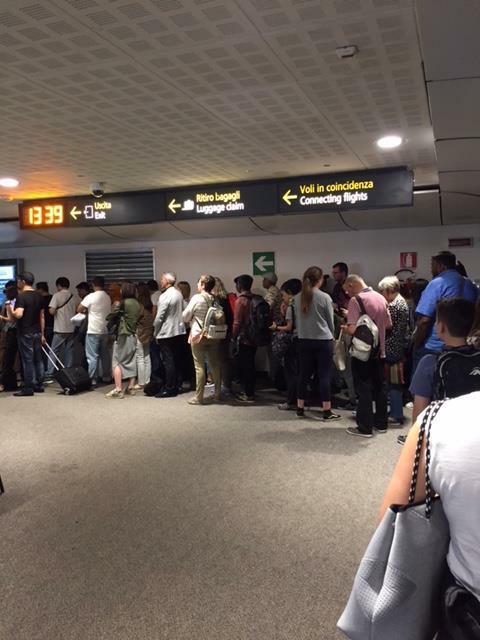 I made this right decision as the line before the Border Police Booth (Immigration Bureau) was congested where three airline flights (Emirates, Turkey Airlines and Qatar Airlines) arrived at the same time. It took me 1.5 hours to exit the Airport from the time I left the door of the plane and getting my check-in baggage at the luggage conveyor. The traffic of passengers was worse than what we usually have at the Maila International Airport! I had a lot of buffer time to wander around the airport and eat my first authentic vegan Italian Pizza in one of the restaurants inside the Airport. 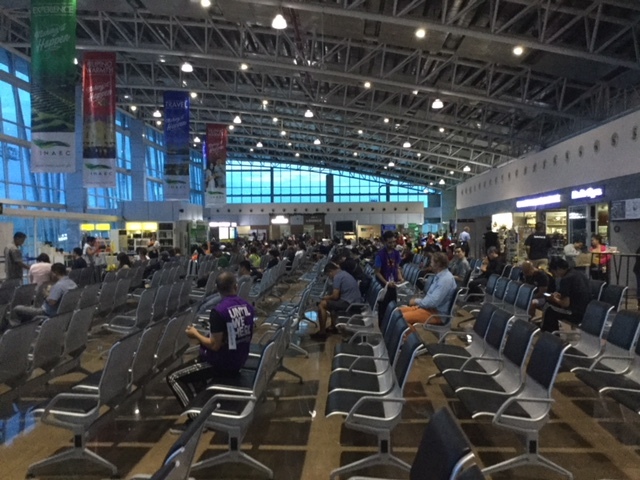 It was already 3:30 PM in the afternoon of Tuesday, June 19 when I tried to get out of the Airport Building to locate where the Bus Terminal was located. The FLIXBUS Terminal (Bus Terminal for all the Buses at the Airport going outside Venice) is located at the left side of the Airport Building (if you are facing the building) and it is about 150 meters from the Exit Door of the building. From the Exit Door turn right and follow the Pedestrian Lane with a Shade on the side of the Road and then another turn right to cross a street and you could see a big vacant lot where buses are waiting. The lot has only one waiting shed with a limited seating capacity. The weather during my arrival in Venice was hot and clear skies, the same temperature and sunny skies that we we usually have in Manila. If I am not mistaken, it was 27-28 degrees Celsius. The FLIXBUS that would be our transport service from the Marco Polo International Airport to Cortina was late for 30 minutes and when the bus arrived, we were surprised that the bus was a Cortina Express Bus! The bus was almost full when it picked us up at the Airport and my Reserved Seat was no longer applicable in the Cortina Express and I just took a sit in one the vacant ones at the 2nd row from the Driver. I was surprised that two of my Pinoy companions who are also participating in the said event were also riding in the said bus as they boarded at Mestre Station. The distance from Venice to Cortina is almost 160 kilometers and it would take at least two hours to travel the said distance aboard a bus. The two Pinoy runners, Arwin Sta Clara and Rodell Castillo who came from the Middle East, alighted from the bus in a town, 20 kilometers before reaching Cortina. They greeted me and they said that they are booked in one of the hotels in the said town. They promised me that we would meet on Friday at Cortina at the Race Pick-Up/Exposition site which is the Ice Olympic Stadium.